Kinesio Taping is a mobilizing tape used to support or inhibit specific muscles in order to improve range of motion and strength in injured, over-active or weakened muscle groups or joints. Kinesio Tape alleviates discomfort in the muscles and facilitates lymphatic drainage by microscopically lifting the skin and manipulating fascia tissue. Kinesio Tape can be applied in hundreds of ways and has the ability to re-educate the neuromuscular system, reduce inflammation, prevent injury and promote good circulation and healing, and assist in returning the body to homeostasis. You may have seen this tape on many of the Olympic athletes during the 2012 Olympic Games, or the 2017 CrossFit Games, and many athletes and sports events alike. ATHLETES love it because using kinesio tape allows them to get back to workouts quicker and recovery from injury. TRAVEL a lot? Using kinesio tape to support the lumbar spine during travel minimizes low back pain during and after long flights. 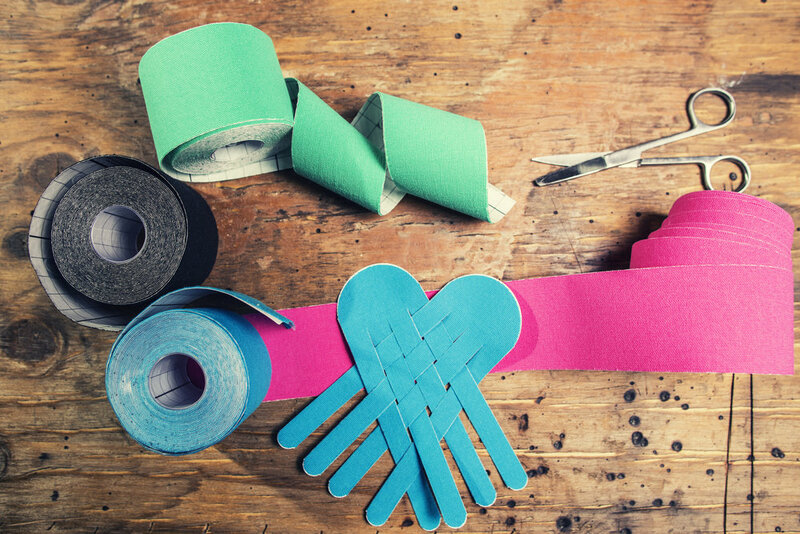 SURGERY recovery can be improved with Kinesio Tape by providing support to weakened areas as the body heals, or aid in lymphatic draining, which helps reduce swelling and bruising. PREGNANCY can place a lot of strain on the musculoskeletal system as it balances the added weight of a baby bump. Using Kinesio Tape strategically can help to support the body, improve posture and distribute the weight of the baby. You can schedule online by using the scheduler above, or give us a call if you have questions about Complete Health or any of our services.